Every step of the building process was thoughtful of the environment. But we know that building green is merely the first step to being green. We're committed to building an ethos that fosters social justice for all. From the artwork to gender-neutral bathrooms, this is everyone's space. Space was planned around enriching the academic experience at UVM. We're all about theory to practice. 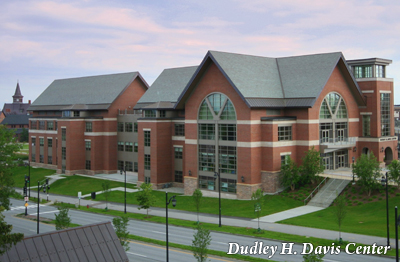 For more information, please visit the Dudley H. Davis Center website. Rooms include a full linen package, air-conditioning and semi-private bathrooms shared by no more than four individuals. There is a required two-night minimum. University Heights is a five minute walk (0.2 miles) to the Davis Center where the majority of the conference is being held, and 2.5 miles from Burlington International Airport (BTV). Each air conditioned room in University Heights comes furnished with two single twin extra-long beds. Rooms will have either one or two beds depending upon occupancy. Beds will be made prior to your arrival. The bedding and linen package includes: one mattress pad and pillow cover, one fitted sheet and one flat sheet, one blanket, one pillow and one pillowcase. You will also be provided with the following bathroom amenities: two towels, one washcloth, one disposable cup, and one bar of soap per person. All rooms are equipped with network and television access points, but rooms are not furnished with a computer or television. There is no charge for access should guests bring their own devices. Telephones are accessible on each residential floor for free local calling. Individual rooms do not have telephones. Looking for a bed & breakfast, campground or different hotel? Please visit the Lake Champlain Regional Chamber of Commerce for additional lodging options. Shuttles will be provided from hotels to campus. Parking permits are required to park on campus during the week, or you will risk getting a ticket. Please click here to review our parking policies. You will receive your parking permit a week prior to the event by email. Burlington International Airport (BTV) is 10 minutes from campus. Burlington VT is approximately a 2-hour drive from Montreal, Canada. Find out what airlines fly into Burlington, VT. Check the Burlington International Airport website.